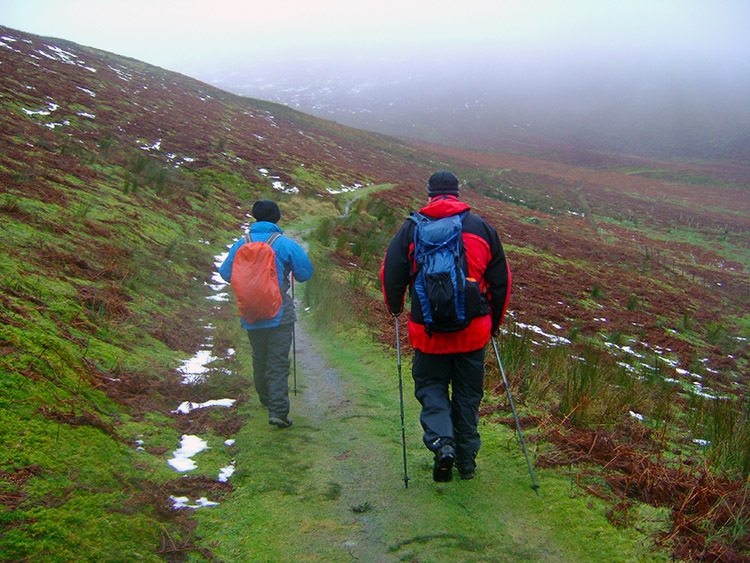 Summary: I did this walk on a miserable winters day in the company of Tim Nobes and John Lister. 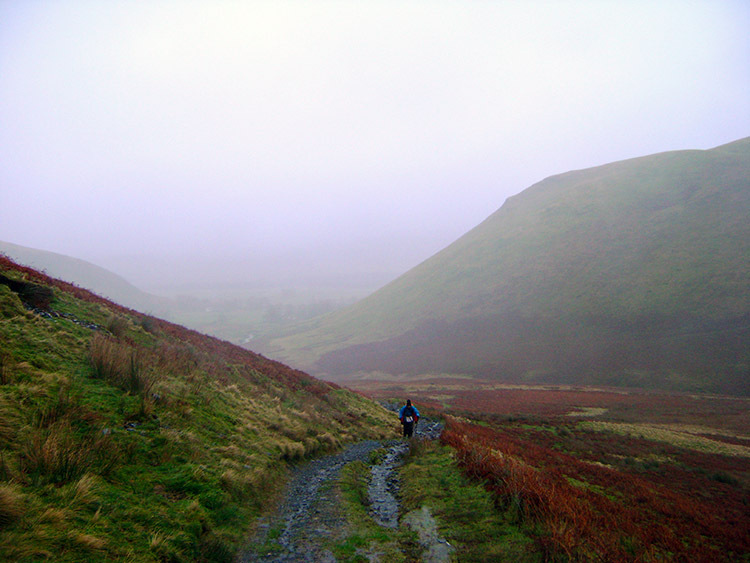 The original intention had been to tackle four Wainwright Fells. We did just two of four missing out on Mungrisdale Common because of the fast melting snow making walking a nightmare across the common. We missed out Souther Fell too, saving it for a better day. 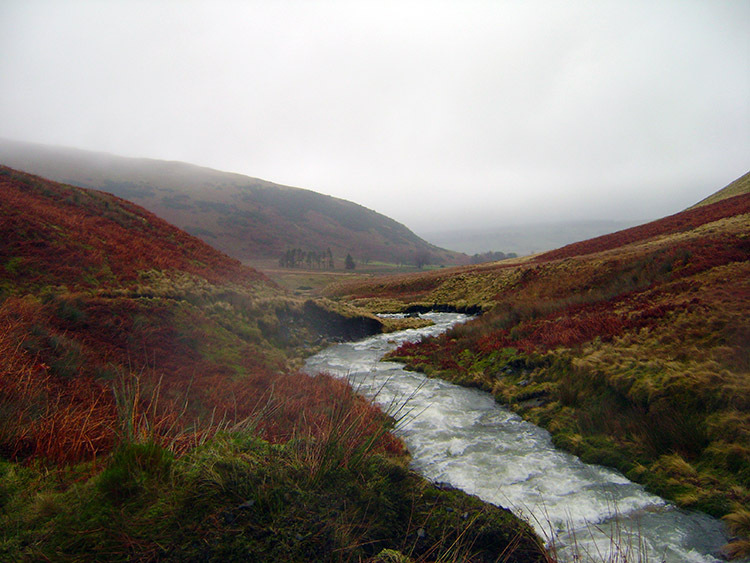 Despite the conditions and lack of good views the close ups of enclosed interlocking spur hills of the valley of River Glendermackin were a lovely sight to behold. Also of great interest was the descent into the valley with an old disused Lead Mine passed by on our way down. 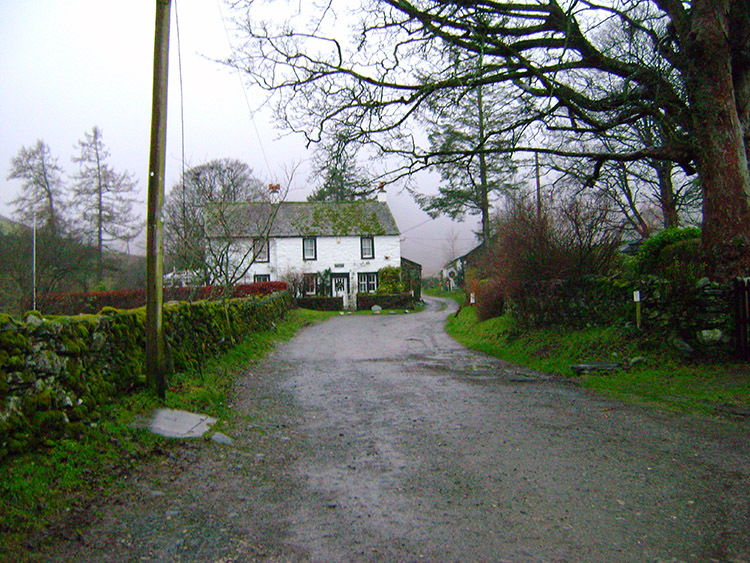 Oh and the pints we all had in the Mill Inn in Mungrisdale at the end were well enjoyed. The Walk: We had planned this walk for some time. First Tim and I had discussed it on Facebook and decided we would do a final year end walk the Wednesday before Christmas. I would travel from Harrogate and Tim from Kendal to meet in Mungrisdale village and attempt a walk of four Wainwrights, both new to us in our respective ambitions to complete the 214 Wainwright Fells (note: not obsessions). Tim is further on than me having about 60 to complete the set. I have less than 100 but not many less. Following our planning of the date and the fells to walk I then contacted John to see if he and his wife Joanne would like to join us. He said yes and so I expected to pick man and wife up in Brough village on the A66 as we agreed. Only John was there, Joanne had final Christmas missions to do, not all of which as it turned out were achievable; more on that later. There is a risk with planning walks in advance, especially in the shorter days of bleak midwinter. The risk is compounded when the walk is some distance away so having gone for it and made the journey the walk just at has to be done. The risk is the reliance on the weather and this time it let us down. On the days leading up to the walk I enthusiastically watched the forecasts for snow was on the mountains of the Lake District and I quite fancied a snow walk on a clear crisp day. The forecasts were OK three days prior and two days prior too but the day before the walk the mood changed as a warm low pressure belt of weather was due to sweep in from the west and wash away some of the snow. The forecast did add it would clear and blow over on the morning of our walk though with most of the warming rain overnight. I hoped it would be just as forecast but on waking on the morning of the walk I look out to a miserable wet scene. No changing plans though, I packed my gear and set off from Harrogate with a dark early morning drive to Scotch Corner and over the A66 to Brough where I would wait for John and as I thought then Joanne too. John arrived just after me at around 7.30am and we continued on in the dreary drizzly conditions to Mungrisdale in the north eastern corner of the Lake District. We waited for ten minutes until Tim arrived. He had put on Facebook "Last one to arrive buys the drinks after the walk". I thanked him for his generousity. Suitably attired in all our wet gear we walked out of Mungrisdale village taking a due west course onto the fell track following River Glendermackin upstream before taking the right fork path at a junction to walk up the south side of Bowscale Fell to the Bield and south of the Tongue toward Pile of Stones on the map that marked the summit. It was miserable from the start but there was enough visibility to excite us with specks of white soon appearing on the nearest fells. Despite the rain snow was hanging on to the higher ground. 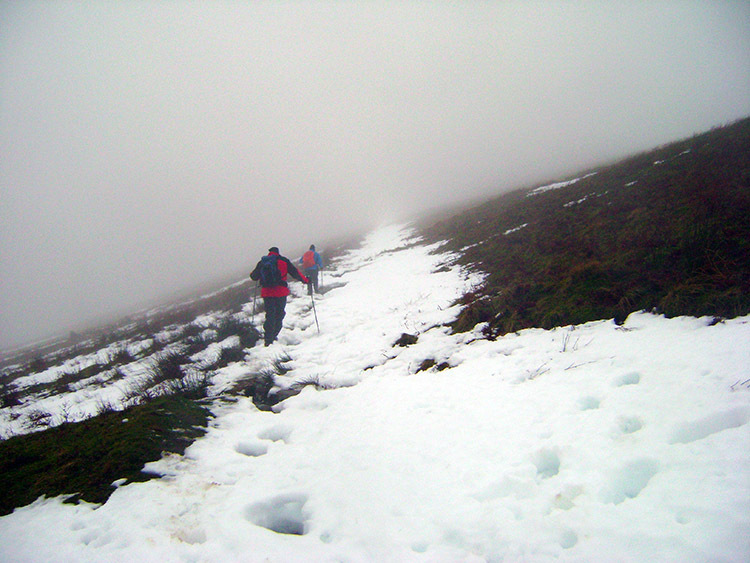 As we continued our steady ascent up Bowscale though the prospect of walking in crisp forgiving snow was soon scotched as the snow was in rapid melt and the path we were following had actually become a watercourse, much like a fast flowing stream in parts and we were often forced off the path and to the edge to walk carefully over tussocky ground. Sometimes our weight went through the snow completely and we ended knee deep in it. Sometimes it was a wet surprise as the water cascading down was hidden under the snow in naturally formed channels and we trod straight through the snow into the streaming water. 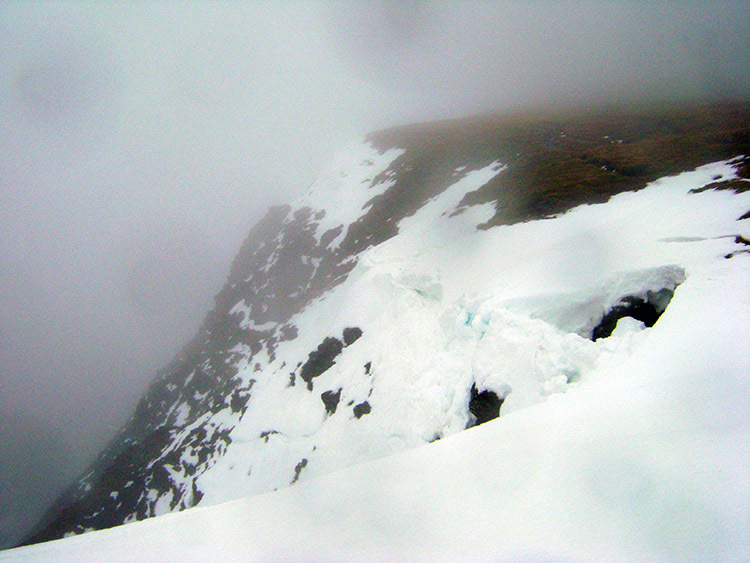 We also made sure to keep a careful distance from the left hand edge of the path too as treacherous snow overhangs gave a sense of ground that did not exist. 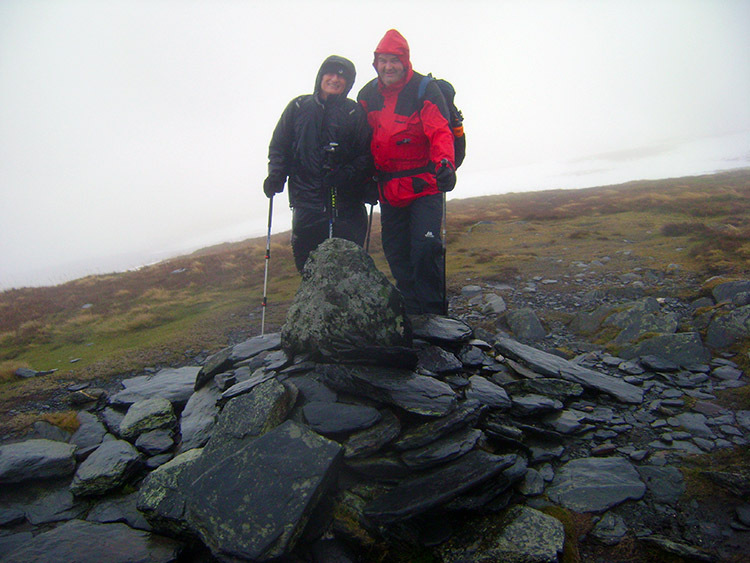 Only the day before we had read of an experienced walker who was swept to his death off a snow overhang in Snowdonia. Care on mountains is always needed. After just short of two miles walking in which we had ascended nearly 1,000 feet we left the track to climb to the breast of Bowscale Fell. As we attained the breast and on the high section between the Tongue and Pile of Stones we struggled in blizzard like conditions. I particularly struggled and one thing became clear to me with alarming cold surging into my left foot toes; my boots were leaking in water and freezing water at that. My trusty Meindl Burma boots that had been my soul mates (or sole mates!) for the last six years were failing. The boots that had taken me over much of the 1,000 mile walk though all my trials and tribulations were giving up. The leaking was consistent, the water was freezing cold and I was to have no respite as we were walking in complete wet snow conditions. Sometimes the bitterness of the wind and driving rain which was horizontal and painful to the exposed face took my attention from my left foot. Sometimes it focused the cold on my hands for despite wearing boots they were soaking through too. We all felt the cold, sometimes we all put our heads down and just walked in silence and ignorance of each other only to look up and see that we all had dispersed from a single group to individual tracks on different bearings. Once we looked up and spotted each other we readjusted and eventually through the struggle we reached Bowscale Fell summit. As the photograph shows the map description applies. It was simply a pile of stones. 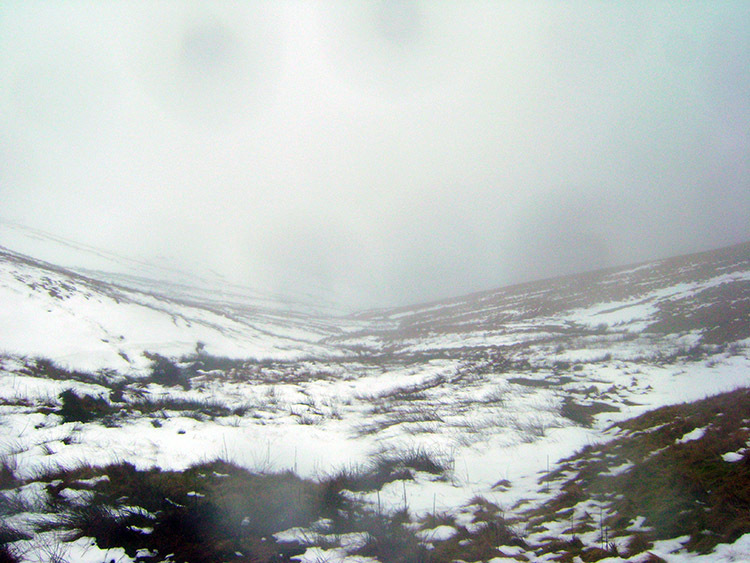 We did not linger longer than taking a quick hot soup, tea or coffee drink before making tracks to Bannerdale Crags. Here we did not stay anytime at all; there was nothing really to see. We headed down to the pass at the head of Mungrisdale and the common which was still our intention of being the third Wainwright Fell of our day. There was slight relief from the driving wind in the shelter of the pass with tracks leading off in several directions. We were not far from Scales Tarn and iconic Sharp Edge. 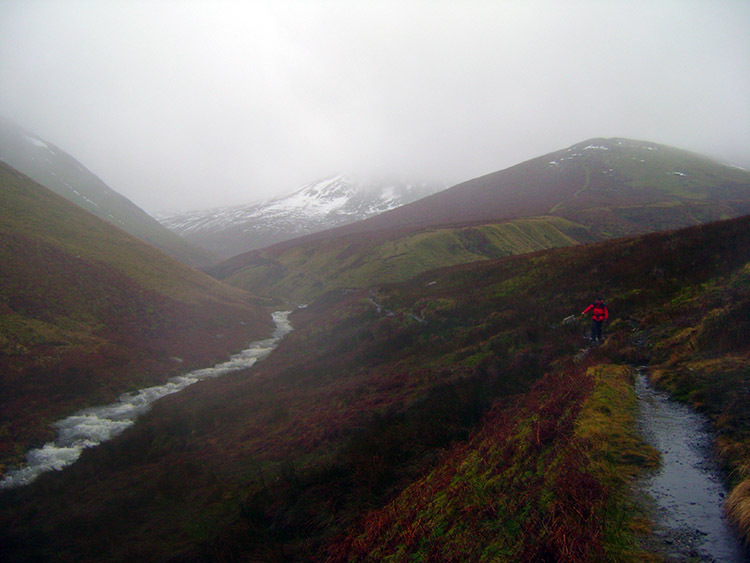 We were not far from Foule Crag, Atkinson Pike or the magnificence of Blencathra but we knew it would be raging up in the heights. Still we still tried to walk across Mungrisdale Common but from the start the path was not easy and we kept collapsing through the snow. John and I went over twice each and both times had to struggle to our feet and brush off the snow and ice, all wet and cold. It was miserable attempting our folly in the conditions, the sky was cloud filled, white grey and featureless. Best we come back and enjoy on a good day rather than struggle and wear ourselves out on such a drab day. And so we all admitted that Mungrisdale Common was a fell too far and we turned around quickly making our way back to the pass. Once there we decided to call it a day and head straight down to Mungrisdale by following the path and River Glendermackin downstream. As we descended the worse of the wind was left behind and at the site of an old lead mine we found just enough shelter to take lunch. We all needed it and my hot soup particularly warmed me inside and warmed my cupped hands too. After eating and drinking we left. It was still too cold, breezy and wet to sit around. As we got further down into the valley we came to a fork in the path which would give access to Souther Fell which was to be our final Wainwright Fell of the intended walk. It was not too much of a detour, not too much height to gain either but we unanimously agreed to leave it until a better day. We continued down the path to the valley floor. he further we walked back the more I was struck by the interlocking spurs of the fells of Mungrisdale and adjoining Bannerdale. The colour was also striking too, deep and glowing reds, browns and contrasting greens. 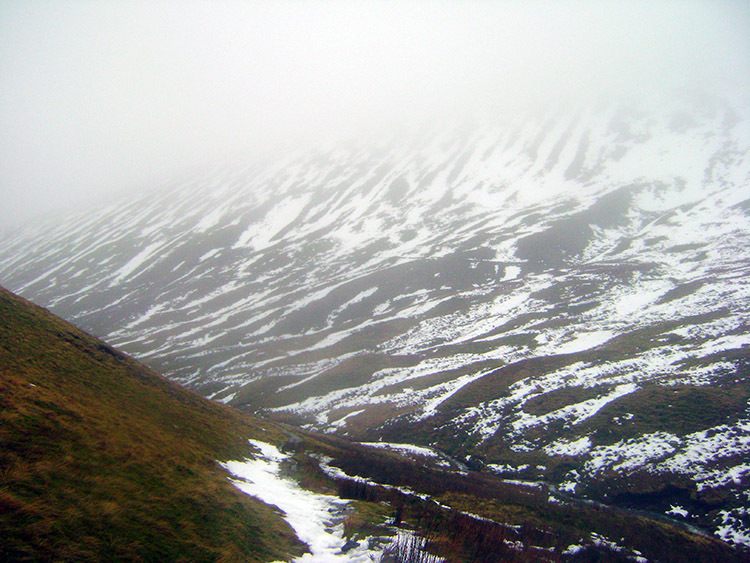 The rushing Glendermackin provided a grey streak through the middle of the palette and the dappled whites of the remaining snow completed the picture. I enjoyed looking at the landscape as we met our original path and walked back into the village. Then we changed out of boots quickly, my left foot still freezing a numb in part too. I put on my dry socks, shoes and headed straight to the warmth of the Mill Inn pub. There Tim, as promised offered to buy the drinks but John would have none of it and got in first. We all really enjoyed a good chat about the good walk we had, really good despite the worse the weather threw at us and we continued the chat to include politics, morals and a plethora of other subjects over our beers until it was time to go. Fortunately we had spent long enough for my left foot toes to regain sensitivity too which was a welcome return to life. We then all wished each other a good Christmas break and we all hoped for better days to walk in the coming year. That would not take much doing!